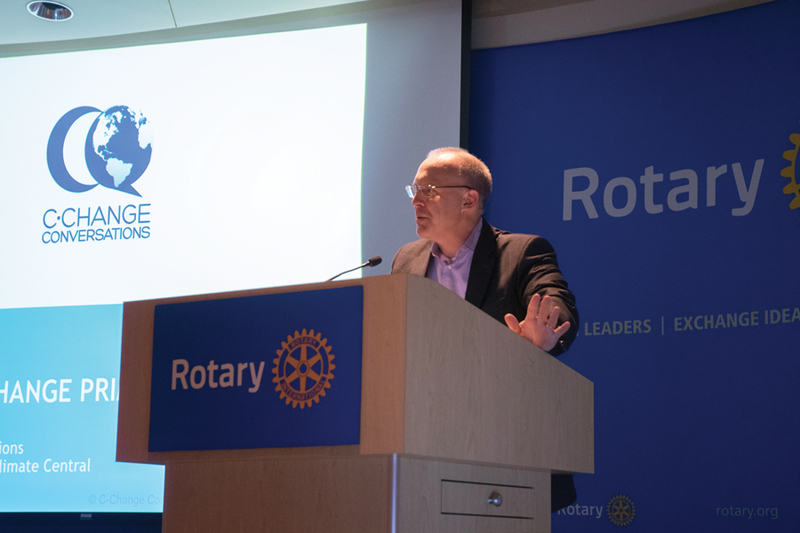 Mayor Steve Hagerty speaks during a Thursday event at Rotary International, 1560 Sherman Ave. Hagerty reiterated the city’s commitment to sustainability efforts. Cities must take climate change prevention into their own hands in the face of a skeptical administration, climate change expert Kathleen Biggins said during a speech Thursday. She addressed a crowd of about 100 people at Rotary International headquarters, 1560 Sherman Ave., as part of a broader event hosted by the Garden Club of Evanston. Biggins is a co-founder of C-Change Conversations, a group that holds climate talks across the country. In addition to Biggins, Mayor Steve Hagerty and Kumar Jensen, the city’s sustainability coordinator, spoke at the event. Biggins walked the audience through a number of climate change-related statistics before pointing out that scientists overwhelmingly agree humans are responsible and the effects must be reversed. But in the United States, she said, climate change has shifted from being strictly scientific to becoming increasingly politicized. She said that across the world, countries have been taking steps to address climate change, culminating in the 2015 Paris Agreement, where signatories promised to reduce their greenhouse gas emissions. After joining on to the agreement initially, the United States — under President Donald Trump — announced its withdrawal in 2017. Since the United States’ withdrawal, governors and mayors throughout the country have made pledges to uphold the climate standards outlined in the agreement. Hagerty said Evanston is committed to sustainability across the city, and that he has been encouraged by residents’ commitments to fighting climate change. News broke that Trump planned to pull out of the climate accord while Hagerty was in a meeting with U.S. Rep. Jan Schakowsky (D-Ill.) and Cook County Commissioner Larry Suffredin. Hagerty said that over the course of the next day, he received five emails from residents urging him to speak out and act. He said these concerns make it even more important for mayors and other local leaders nationally to take charge and step up when it comes to combating climate change. Jensen said the city is committed to transition to using 100 percent clean energy, and reducing its emissions in accordance with the Paris Agreement guidelines. He said the city set a goal of 26-28 percent emission reduction by 2025, surpassing the 25 percent mark in 2016. By 2050, he said, the city hopes to reduce its emissions by 80 percent. The plan is scheduled to be finalized by July, when it will be available for public comment, Jensen said. After receiving feedback from residents, the plan will move before City Council in October. Jensen said the city’s climate action plan is in its third iteration, which he said is a unique situation in the country.